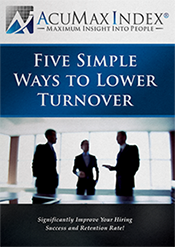 Five Simple Ways to Lower Employee Turnover! Learn how to significantly improve your hiring success and improve retention rate. Turnover is time consuming, disruptive, and frustrating. Replacing employees is tough on a company’s bottom line too. We’ve prepared this report to show you how we easily bring about a shift in a company culture with substantial impact on its financial health by using the AcuMax Index.